The test wells are part of a $30 million multi-agency study now underway that incorporates experts from the Water System of Mexico City (SACM), the National Water Commission (CONAGUA), the engineering and geology departments of the National Autonomous University of Mexico (UNAM), and Pemex, which is providing the technology to drill the wells. Later this month, Pemex will start drilling the first 2000-meter-deep test well in the Magdalena Mixhuca Sports City area, in the eastern part of Mexico City. Each well will cost an estimated $7.6 million to complete. 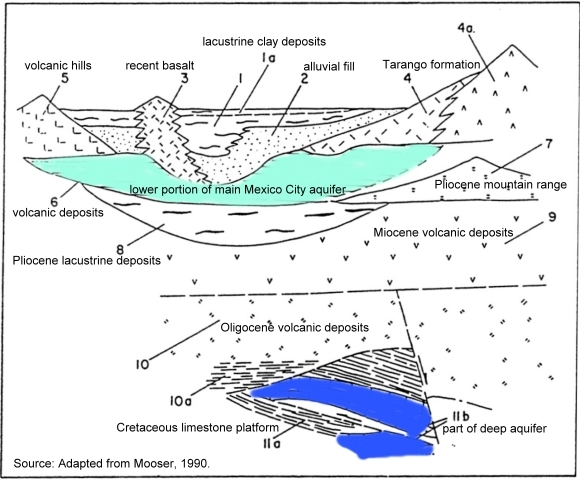 Schematic stratigraphy of the southern portion of the Basin of Mexico. Source: Adapted from Mooser, 1990. Ramón Aguirre, the CEO of SACM, says that the two test wells will target two different zones, increasing the chances of demonstrating the value of the aquifer as a viable source of water for Mexico City. In particular, Aguirre expects the wells to help confirm that there is an impermeable cap of clay separating the deep aquifer from the principal aquifer in the area (from which water is already extracted). An impermeable layer would mean that water could be safely removed from the deep aquifer without leading to downward drainage of water from the aquifer above. It is expected to take about two years for the initial studies to be completed. In its National Water Plan, CONAGUA has warned that population growth in the Valley of Mexico could result in serious water shortages by 2030, reducing annual availability from about 4,230 cubic meters/person to less than 1,000 cubic meters/person. The major aquifer currently used lies at a depth of between 60 and 400 meters and is heavily over-utilized. There are about 630 wells in the Federal District alone; all are overexploited and have an average life expectancy of 30 years. Current extraction from the aquifer is around 17,000 liters/second, while its natural recharge capacity is only 8000-9000 liters/second. It is believed that the deep aquifer could be capable of supplying approximately 5000 liters/second.